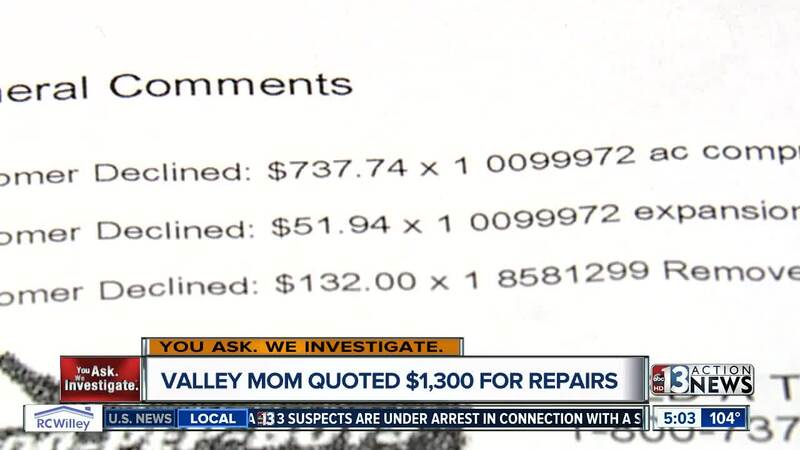 A Las Vegas mom is glad she followed her gut instinct and got a second opinion after she received an estimate for hundreds of dollars in car repairs she did not need. Monica Padilla needs her car to get around for work and her three kids. Last week, the air conditioner on her 2014 Hyundai Sonata started to act up. "When something like this happens, you're not prepared for it, plus with the triple digits were having made it much worse," said Padilla. Padilla elected to bring her car to a Pep Boys located near Rancho and Cheyenne to have it checked out. Technicans at the repair shop looked under the hood and gave Padilla's car a grave diagnosis. "They said my air compressor was kaput, that's what they said," added Padilla. Contact 13 obtained the invoice from Pep Boys and quotes a list of charges for a new compressor and additional repair work. "I was very upset, because I don't really have $1,300 just lying around," said Padilla. Padilla said the store even offered a 10 percent discount and a Pep Boys credit card to pay for the repair work. Padilla said her gut told her to seek out a second opinion so she brought her car to the dealership. "It was a lot of money, especially on one income, and I'm on a budget," said Padilla. According to paperwork Padilla provided Contact 13, technicians at the dealership found a plastic bag was stuck in a blower motor causing a disruption in the air conditioner. Technicians noted once the bag was removed and the system recharged, the air conditioner was blowing 36 degree air. The report showed no other mechanical issues and the dealership charged Padilla $140. "It was my gut feeling, always get a second opinion," said Padilla. "We have attempted to contact the customer and we will always make it right if one of our technicians misdiagnosed a customer's vehicle. At Pep Boys, we strive to provide our customers with an exceptional experience every time they come to one of our locations. We are continually investing in training and education to improve our technicians' skills and enable them to provide outstanding customer service." Padilla tells Contact 13 the director of Pep Boys Nevada has called to apologize.